It’s a given that daisies are the happiest of plants so when you fill out a container planting of them with equally cheerful flowers like petunias and calibrachoa in bright shades of pink, yellow, and red, it’s so easy for the whole thing to take a sharp turn into crazy clown town. So how do you dial down the effusiveness of a container planting when the main act is a big, brash bunch of fresh white daisies? Go glam and ring them in silver and gold, of course. Here’s how. 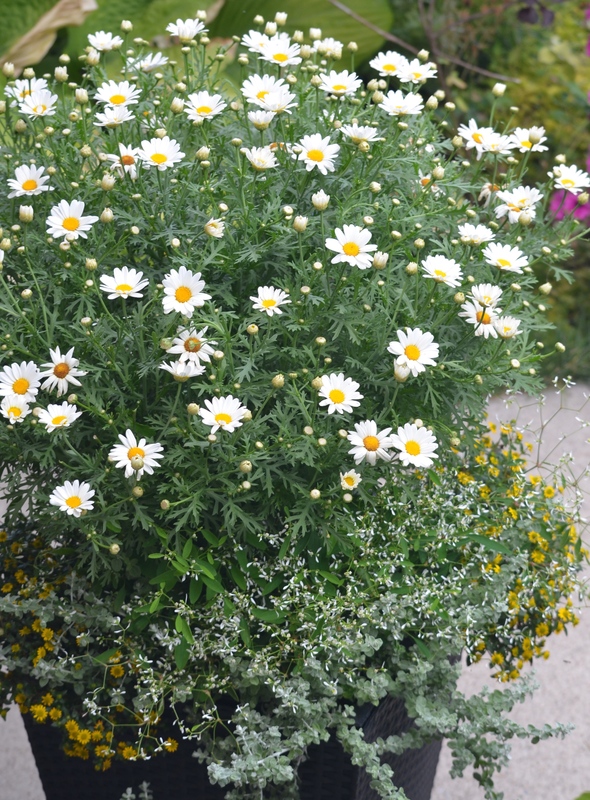 PLAYING UP TEXTURES: Daisy foliage often gets overshadowed in container plantings but in this recipe the tiny leaves on the other three plants and the fine intertwining of their stems quietly work with the daisies to create a tapestry of rich texture. Keeping all the plants finely textured also allows the bright white, simply-shaped daisies to be the stand-out stars of the show. USING ACCENT COLOURS: I chose this Sanvitalia because it’s the exact same colour as the centres of the daisies. The silvery Helichrysum complements rather than clashes with the the soft green, almost grey-green daisy leaves. The sprays of tiny white petals on the Euphorbia echo the white daisy petals and add sparkle. Look for a long lasting daisy. As much as my inner fashionista wanted a container combo for my front walkway that exuded elegance-with-a-twist, my all-round lazy person wanted an arrangement that would look good from the moment I planted it up in early spring to the last warm days of fall. This meant finding a ‘thriller’ (the daisies) that would not only continuously bloom all season long but withstand cool spring and fall weather and a hot summer. ‘White Butterfly’, a new introduction to Canada for Spring 2017 from Proven Winners, worked well in this respect. I was asked to trial it last summer (2016) and found these daisies coming up daisies continuously throughout some very hot, humid summer days and well into October. Throw a little shade on it. 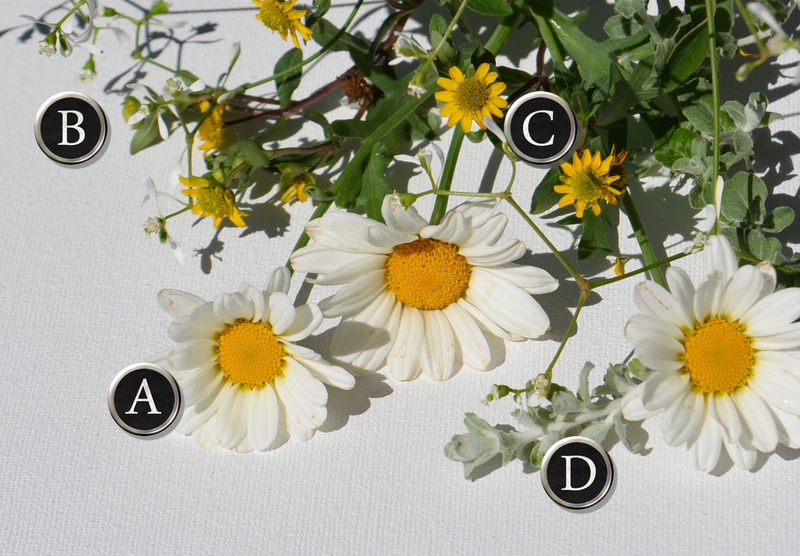 One small criticism I have about the daisies is that the product info stated “no deadheading required for season-long bloom but can be sheared back in midsummer”. I found myself deadheading this daisy regularly to keep the look tidy. I thought an absolute lack of deadheading sounded a bit too good to be true, to be honest, and I didn’t mind the occasional quick pinching-off of spent blooms as I passed by the container. (To me touch-ups like that are part of the pleasures of gardening.) But keep in mind that daisies will slow down when temps are high both day and night. You can shear all the daisy heads off, as mentioned, to reinvigorate the plant in summer. As well, to keep this combo looking its best all season long, I recommend positioning it where it’ll get lots of sun from morning to afternoon but shade in mid-to-late afternoon when the sun’s rays can be their warmest in summer. All four of the plants in this container recipe are part shade tolerant. If you like this container recipe but want more colour, try my Purple Reigns All Summer In This Container recipe, featuring African Daisies in a lush planting of rich plums.